This Sticky Toffee Pudding Sundae post was sponsored. Put an American spin on the British classic, Sticky Toffee Pudding. 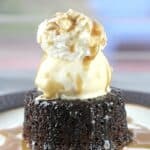 Delicious, perfectly spongy cake, soaked with luscious Sticky Toffee Sauce, and topped with ice cream and Reddi-wip Original Whipped topping is a very special way to celebrate all the fun of summer with family and friends….